Lactobacillus rhamnosus side effects may include stomach bloating or intestinal gas as the probiotic supplement is introduced in the diet. In most cases, these side effects pass quickly and dissipate following a few days of use. Lactobacillus rhamnosus probiotics are generally considered to be safe when administered appropriately and taken by healthy adults. This friendly bacteria is found naturally in the human gastrointestinal tract and confers a positive effect on the digestive system and the immune system. The L. rhamnosus strain of bacteria is used safely in adults and in children to prevent diarrhea, support the immune system, improve digestive problems, relieve symptoms of IBS and IBD and to support weight loss. Research shows a number of additional benefits as well. In research studies, Lactobacillus rhamnosus and other probiotics from the Lactobacillus family have been used safely for up to nine months in adults and up to 15 months in children. However, adverse effects may occur if probiotics are given to individuals with certain medical conditions. Continue reading to learn about the potential negative effects that have been reported and how you can reduce your risk of adverse reactions. Oral use of Lactobacillus rhamnosus is generally well tolerated with a low rate of reported side effects. In some cases, flatulence (gas) is reported when first starting to use this product. This generally subsides with continued use of the supplement. Lactobacillus rhamnosus is also sometimes used intravaginally to treat yeast infections, urinary tract infections or bacterial vaginosis (BV) in women. According to research studies, vaginal use of this probiotic is also well tolerated with low risk of side effects. L. Rhamnosus has also been used safely in children and infants. It is often administered to children to improve symptoms of rotaviral diarrhea and antibiotic-associated diarrhea. It has been administered to babies and children aged 6 to 36 months. However, usage in children should be supervised by a physician. 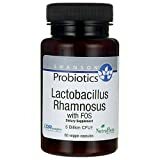 Safe dosages Lactobacillus rhamnosus are between 1 – 10 billion CFUs (colony forming units) per day, taken in 2 – 4 doses a day. Colony forming units is a measure of the number of viable living organisms administered per dose. While safe for the majority of healthy adults, Lactobacillus rhamnosus and other probiotic supplements should not be used by individuals who are immunocompromised or who are allergic to these bacteria. For those with compromised immune systems Lactobacillus rhamnosus side effects include a risk of developing an infection which can be fatal. The body of an impaired immune system can be infected by an otherwise healthy probiotic that is considered beneficial in functioning immune systems. Those using a catheter or those with open surgical wounds should also avoid probiotics. An allergic reaction is also a possibility. Symptoms of this condition include hives and difficulty in breathing. Swelling of the face, lips tongue or throat may also occur. For those with milk allergies a probiotic that is milk based may cause stomach cramps and diarrhea. While probiotic bacteria are healthy when they colonize the gut and urogenital tract, they can cause negative effects if they spread to other parts of the body. This is rare in most individuals, but infections have been reported in patients who are immunocompromised, have short bowel syndrome (SBS) or individuals using catheters. A clinical study published in the International Journal of Hematology in December 2014 cited a case of severe oral infection with a high fever due to Lactobacillus rhamnosus. This infection happened during induction chemotherapy for acute myeloid leukemia. The patient had been taking dairy products before starting chemotherapy. Pulsed-field gel electrophoresis using two different restriction enzymes identified the strain isolated from the patient was identical to the L. rhamnosus GG strain isolated from dairy products and ATCC #53103. A clinical study published in Beneficial Microbes in December 2014 showed a Lactobacillus rhamnosus GG ATCC 53103 infection was suspected in a 6 day-old newborn with intrauterine growth restriction (IUGR) symptoms. IUGR is poor growth of a fetus while in the mother’s womb during pregnancy. This can be caused by poor maternal nutrition or lack of adequate oxygen supply to the fetus. The infant was treated with antibiotics and given L. rhamnosus GG to prevent antibiotic-associated gastrointestinal complications. The connection between the infection and the probiotic L. rhamnosus GG was confirmed with a blood sample on day 6 which was found to be positive for Lactobacilli. The isolate was pre-identified as L. rhamnosus or Lactobacillus casei on day 11. The strain identity was then verified as L. rhamnosus GG through PCR (polymerase chain reaction, a method to analyze a short sequence of DNA or RNA) and 16S rRNA sequencing. This type of sequencing is used as the standard for classification and identification of microbes. Genotyping with the rep-PCR and AFLP (Amplified fragment length polymorphism) methods confirmed the 100% genetic similarity for both the strain isolated from patient blood and the probiotic product. The clinical study concluded that a new group of at risk patients who should avoid probiotics should include IUGR with a possible link to L. rhamnosus GG bacteraemia. Other at risk groups includes patients with organ failure, patients with immunocompromised status and those with dysfunctional gut barrier mechanisms. A clinical study published in Transplant Infectious Diseases in December 2010 reported a case of Lactobacillus empyema (pus and fluid from infected tissue collects in a body cavity) in a human immunodeficiency virus-infected (HIV) lung transplant recipient receiving a probiotic containing Lactobacillus rhamnosus GG. The epidemiology of Lactobacillus infections in heart and lung transplant recipients at the institution before and after the introduction of this probiotic was discussed. The study concluded there was a potential mechanism for Lactobacillus within the probiotic to cause infections and spread. A clinical study published in the Journal of Infection and Chemotherapy in February 2010 reported a case of a lung abscess and pleuritis caused by Lactobacillus rhamnosus in 79 year old male immunocompetent patient. A chest computed tomography scan showed a mass lesion (?40 mm) in the left lingular segment. Inflammatory markers were elevated and there was left chest pain and a fever in the range of 38.0 to 38.9 °C. Lactobacillus spp. was detected from the pleural effusion by culture and it was concluded this was organism responsible for the infection. The causative organism for the infection was identified as Lactobacillus rhamnosus by the 16s rRNA sequence. What made this particular case unique was the fact that the patient was not considered to be immunodeficient. But the lung did have an impaired local immunosystem, due to emphysema. This condition was enough to put this patient at risk for an Lactobacillus rhamnosus associated infection. A clinical study published in the European Journal of Clinical Microbiology & Infectious Diseases in September 2012 showed L. rhamnosus was the most commonly isolated species and was found in blood cultures from 16 patients. An additional 45 patients were reported in clinical literature. The study concluded patients presenting with L. rhamnosus bacteremia experienced nosocomial (hospital associated) infections associated with both immunosuppression which accounted for 66% of the cases and from catheter usage which occurred in 83% of the cases. Lactobacillus rhamnosus side effects can be very severe and even fatal for those with impaired immune systems or those with open surgical wounds or using a catheter. In these cases probiotics should be avoided. Sadowska-Krawczenko I, Lactobacillus rhamnosus GG suspected infection in a newborn with intrauterine growth restriction. Benef Microbes 2014 Dec;5(4):397-402. doi: 10.3920/BM2013.0074. Luong ML, Lactobacillus probiotic use in cardiothoracic transplant recipients: a link to invasive Lactobacillus infection? Transpl Infect Dis 2010 Dec;12(6):561-4. doi: 10.1111/j.1399-3062.2010.00580.x. Epub 2010 Oct 7. Shoji H, Lung abscess and pleuritis caused by Lactobacillus rhamnosus in an immunocompetent patient. J Infect Chemother 2010 Feb;16(1):45-8. doi: 10.1007/s10156-009-0004-5. Gouriet F, Lactobacillus rhamnosus bacteremia: an emerging clinical entity. Eur J Clin Microbiol Infect Dis 2012 Sep;31(9):2469-80. doi: 10.1007/s10096-012-1599-5. Epub 2012 Apr 28. Cannon JP, Pathogenic relevance of Lactobacillus: a retrospective review of over 200 cases. Eur J clin Microbiol Infect Dis 2005 Jan;24(1):31-40.